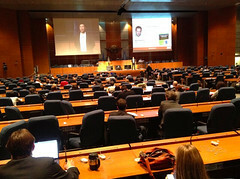 I’m presenting here at Webcom in Montreal, sharing the State and Future of Social Business. In fact, I think the Cluetrain as we know it, while right for many years, needs modification to represent how the social web is changing. I took the first three theses of the mainfesto and translated it to represent how I see advertising integrating with social as well as optimization and Social Performance software. Trend 1: Corporate Websites Reborn. I assert that corporate websites as we know them will be defunct, instead they will dynamically assemble content on the fly, making every page dynamic based on social data. Trend 3: To be Heard, You Will Pay: With every brand using social networks promoting their latest product, the space is getting saturated, as a result, social networks will monetize by making content visible, via ads. I recently completed a research report covering Trend 2: Learn about the Social Media Management System space, and my upcoming report on the integration of Paid, Owned, and Earned, will publish in June. A lot of this focus is on the customer interactions, but for a complete view, also see Charlene Li’s report on internal enterprise social networks and my research on how companies are organizing internally, to understand how companies are trying to ‘catch up’ internally.